Jane Garvey is a British radio presenter. 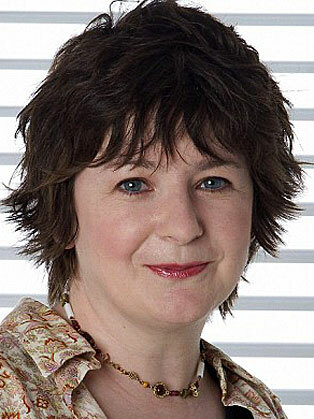 Jane Garvey is best known for her current role as a BBC Radio 4’s Woman’s Hour radio presenter. Jane Garvey was employed as a medical records clerk in a finance company, as a trainee for an advertising agency and as a receptionist, before becoming a promotions assistant for Radio Wyvern, where she later became news editor before leaving in 1988 to join BBC Hereford and Worcester as a reporter. The station began in February 1989. In 1989, Garvey was presenter of The Breakfast Show at BBC Hereford and Worcester, where Ben Cooper (later head of daytime programmes at Radio 1) worked as her assistant. Garvey was the first voice on BBC Radio 5 Live when it launched at 5am on 28th March 1994. She became the co-presenter of 5 Live's award-winning breakfast programme in 1994, and also presented the Everywoman programme on the World Service channel. She was also the presenter of the relaunched Midday show on BBC Radio 5 Live, (during which the award-winning "Postcards from the Street" series by Stan Burridge was broadcast). Her final long-term assignment on 5 Live was as co-presenter of its Drive show on weekday afternoons with Peter Allen. She and Allen have won four Sony Gold Awards. In September 1997, Garvey was a passenger on the Swansea train in the Southall rail crash and received praise for her on the spot reports. In September 2007, it was announced that she would leave 5 Live after 13 years and on October 2007 she joined Radio 4’s Woman’s Hour programme as the second principal presenter.